First off, we want to encourage everyone to support the NCAE teachers action at the State Legislature on Wednesday, May 1 during the day. They have a great 5 point agenda of demands and are planning a massive day of action and rallies. More information here. 6:15pm – March kicks off. Stops with short rallies at new police HQ, City Hall and McDonalds. We are hoping to have speakers at each of these stops. RSVP and invite friends to Facebook event page here. Who does Durham belong to? Does it belong to the bosses, landlords, police, and ICE; those that own the condos and run the jail? Or does it belongs to the workers, the incarcerated, the oppressed, and migrants? We demand that the $3 million proposed by City Council for hiring 72 more police be spent on affordable housing, living wage union jobs, mental health care, and education. We demand that money be reinvested to support worker organizations, to build unions and fight back against employers. Rather than this money be spent to protect the rich and owners, at the expense of all the exploited communities that have the right to call Durham home, especially the displaced Eno people, the Occaneechi Band of the Saponi nation, Tuscarora nation and Catawba nation. We demand that the trillions made by the workers across the country, not be spent by Trump, the Pentagon, and corporate profiteers on war. Instead, it should be spent on the people’s needs. We support Black, migrant, trans, queer, and indigenous people. No where is the exploitation of these workers more apparent than in the US prison system. We support the liberation of all prisoners. We stand with Kanautica Zayre-Brown, against her systematic torture and the state’s attempt to rob her of her identity, freedom and dignity. She is a Black trans women held at a Warren County men’s facility. We support state workers fighting for trans-inclusive health care. 40% of all women workers in low wage jobs face sexual harassment. 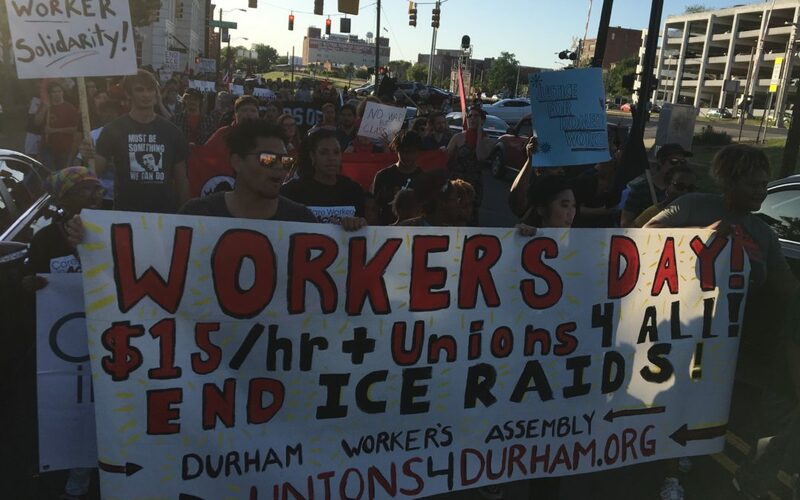 McDonald’s workers in Raise Up in Durham are reclaiming their power and organizing against this epidemic. We stand with them to demand safety and dignity on the job. #MeTooMcDonalds. 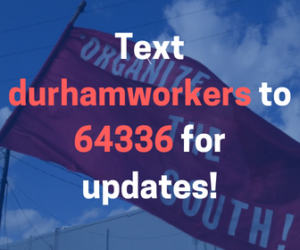 Workers in the City of Durham are organizing against the structural changes that are causing a work speed up, more force overtime and increased licenses and degrees. With position vacancy rates as high as 11.1% in Water Management and 15.3% in Public Works, we should all be concerned about understaffing and over-working the current employees. We stand against the white management structure engaged in racist hiring and promotions. We support the Durham City Workers Union, chapter of UE local 150, and the movement to repeal the Jim Crow ban on public sector collective bargaining. This is why we say “No Walls in the Workers Struggle.” No walls on the border. No prison walls. No walls to divide workers. As the Durham working class, we reclaim our city! Join us on May Day we march together! ***This is a kid and family-friendly event.